"Salmiak" redirects here. For the inorganic compound, see Salmiak (inorganic compound). Salty liquorice, salmiak liquorice or salmiac liquorice, is a variety of liquorice flavoured with the ingredient "salmiak salt" (sal ammoniac; ammonium chloride), and is a common confectionery found in the Nordic countries, Benelux, and northern Germany. Salmiak salt gives salty liquorice an astringent, salty taste (hence the name); the flavour can be considered akin to tannins—a characteristic of red wines, which adds both bitterness and astringency to the flavour. Consuming salmiak liquorice can stimulate either a savoury or unsavoury palate and response. Anise oil can also be an additional main ingredient in salty liquorice. Extra salty liquorice is additionally coated with salmiak salt or salmiak powder, or sometimes table salt. A pocket tin containing small salmiak liquorice pastilles in the traditional diamond shape. Pastilles are usually of the hard liquorice lozenge variety. Salmiak liquorice candy in the traditional diamond shape. The candy variety are usually of the soft to medium-soft liquorice variety. Salmiak liquorice candy produced in various different shapes. Salty liquorice candy and pastilles are almost always black or very dark brown and can range from soft candy to hard pastille variety, and sometimes hard brittle. The other colours used are white and variants of grey. Salty liquorice or salmiak is also used as a flavouring in other products, such as ice creams, syrups, chewing gum and alcoholic beverages. Sal ammoniac (ammonium chloride) has a history of being used as a cough medicine, as it works as an expectorant. Finnish author Jukka Annala [fi] speculates that salty liquorice has its origins in pharmacy stores that manufactured their own cough medicine. 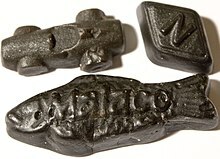 Where and when ammonium chloride and liquorice were first combined to produce salty liquorice is unclear, but by the 1930s it was produced in Sweden, Finland, Norway, Denmark and the Netherlands as a pastille. 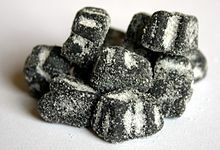 Different languages often refer to salty liquorice as either "salmiak liquorice" (Swedish: Salmiaklakrits; Danish: Salmiaklakrids), or simply "salt liquorice" (Swedish: Saltlakrits; Danish: Saltlakrids). The Dutch refer to it as "Zoute Drop" or even a variety called "Dubbel Zoute Drop" (double salted liquorice). In Germany, they are commonly known as salt liquorice (Salzlakritz) candy and salmiak pastilles (Salmiakpastillen) or simply Salmiak, in contrast to sweet liquorice (Süßlakritz) candy. 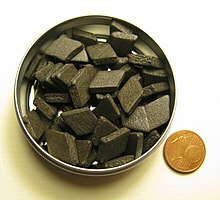 A traditional shape for salty liquorice pastilles is a black diamond-shaped lozenge. In Finnish it is known as salmiakki. The strength of the confectionery depends on the amount of food grade ammonium chloride (salmiak salt) used, which varies by country and what's considered a safe amount. In Sweden for example, the most popular types of salty liquorice contain an average of 7% of ammonium chloride. In 2012 there was a European Union proposal to limit the amount to 0.3%, which was met with wide opposition. Although the European Union now regulates the use of ammonium chloride to 0.3% in most foodstuffs, there is no specific restriction for it in liquorice or ice cream. At a level of up to 7.99% ammonium chloride, salmiak pastilles are considered a "traditionally-applied medicine to assist expectoration in the airways". Reaction of (ammonium)-ions in base solution to ammonia and water. Before implementation of the current European Union community-wide list of permitted flavouring substances used in food, national food legislation in Germany required that a content from above 2% ammonium chloride (salmiak salt) in salty liquorice, was required to carry the label "Adult Liquorice - Not Children's Liquorice" (Erwachsenenlakritz - Kein Kinderlakritz) on packaging in Germany. When the ingredient content of ammonium chloride (salmiak salt) was between 4.49% and 7.99%, the declaration "extra strong" (extra stark) was also required on packaging. More than 7.99% of ammonium chloride (salmiak salt) was not permitted in Germany. In addition to being used in candy, salmiak is also used to flavour vodka, chocolate, distilled rye brandy, ice cream, cola drinks, snus, and meat. Salzige Heringe (Salty Herrings), a popular German-brand of Salmiak liquorice candy shaped as Herring fish, produced by the German candy manufacturer Katjes, currently containing 2% Salmiak-salt and 6% Liquorice-root extract (formerly 1.8% Salmiak-salt and 4.5% Liquorice-root extract). ^ a b Binelli, Mark (24 October 2018). "The Candy Issue: Salty Tooth". The New York Times Magazine. ISSN 0362-4331. ^ "Salammoniac: Salammoniac mineral information and data". Mindat.org. Hudson Institute of Mineralogy. ^ "Winter Hazards". Hennepin County Medical Center. 2004. Archived from the original on 4 March 2012. ^ a b "Mistä johtuu, että salmiakki on herkkua vain Pohjoismaissa?". Kysy.fi (in Finnish). Helsinki City Library. 17 October 2008. Archived from the original on 4 May 2012. ^ "Minun kuuluisi tehdä esitelmä Ranskassa salmiakista, enkä ole löytänyt tietoja..." Kysy.fi (in Finnish). Helsinki City Library. 25 October 2008. Archived from the original on 4 May 2012. ^ Oskar Forsberg (12 October 2012). "Saltlakritsen räddad efter beslut i EU" (in Swedish). Aftonbladet. ^ a b c "Salmiak-Pastillen: Salzig und gesund?" [Salmiak lozenges: salty and healthy?] (in German). Berlin: Norddeutscher Rundfunk. 10 March 2014. 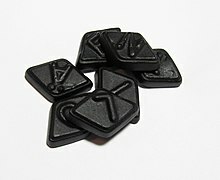 ^ "Erwachsenenlakritz – kein Kinderlakritz" [Adult Liquorice - Not Children's Liquorice] (in German). Berlin: Verbraucherzentrale, Lebensmittelklarheit: Internetportal gefördert im Rahmen der Initiative "Klarheit und Wahrheit" des Bundesministeriums für Ernährung und Landwirtschaft. 14 July 2017. Binelli, Mark (October 24, 2018). "The Candy Issue: Salty Tooth". The New York Times Magazine. ISSN 0362-4331. Wikimedia Commons has media related to Salmiak candy. Mark Bosworth (4 October 2013). "Salty liquorice: The not-so-sweet sweet". BBC News. Retrieved 4 October 2013.